Starring: Viggo Mortensen, Omar Sharif, Louise Lombard, Zuleikha Robinson, J.K. Simmons. Viggo Mortensen delivers a stellar performance as the legendary distance rider Frank Hopkins in Disney’s largely fictional telling of his entry into the ‘Ocean of Fire’ race. With the help of his mustang Hidalgo, Hopkins must battle across 3000 miles of the Arabian desert against Arabian horses, their contempt at him for being an outsider, and the religion of the land. This emotive tale about the bond between a man and his horse falls into the select group of Disney’s best live-action movies. There are a few enjoyable cameos from J.K. Simmons and Malcolm McDowell, but the only thing missing is the consistency as, at numerous time, the film nearly comes to a complete standstill. The forbidden love affair is also not entirely necessary due to the partially fictitious nature of the film (the ‘Ocean of Fire’ race does not exist). It’s hard to say Mortensen or Hidalgo is who the audience will enjoy watching more. 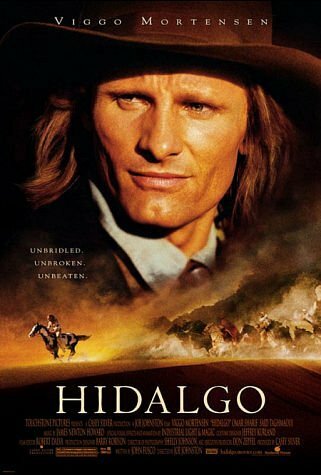 From the events of the Wounded Creek Massacre to the tight finish, Hidalgo is a movie that people will be drawn into watching over and over again. Tagged 4/5, Action, Family, Film, Review, Western. Bookmark the permalink.